On Friday, September 28, 2018, fifth grade students at Monterey Hills Elementary School enjoyed a visit from Superintendent Geoff Yantz who offered tips and encouragement for their upcoming week-long Outdoor Science School adventure in Malibu, Calif. Operated by the Los Angeles County Office of Education, the science school provides environmental science education for students in a residential camp setting. For years, students from South Pasadena Unified at all three elementary schools have enjoyed this unique outdoor classroom experience on the coast of the Pacific Ocean. 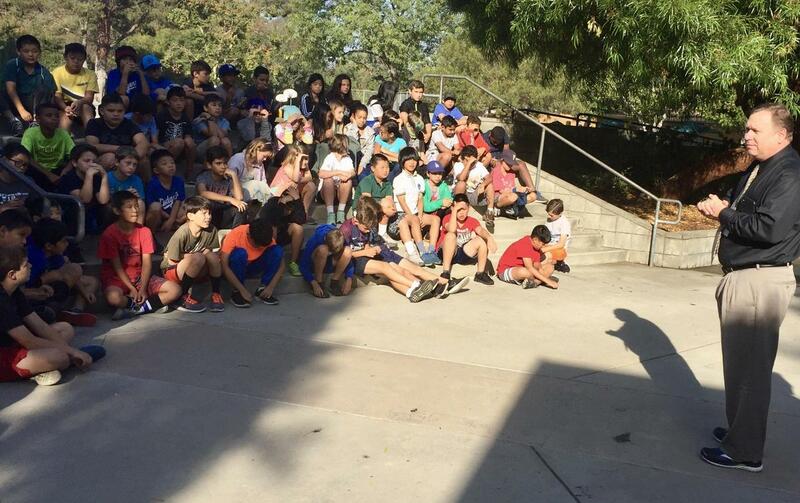 In the fall, Monterey Hills and Marengo fifth graders attend while in the spring, Arroyo Vista students participate. During each week of camp, a group of South Pasadena High School students assist teachers as chaperones in this hands-on learning environment.